You’ve secured a real estate license and are ready to make 2016 your breakout year as an agent. Smart move. According to Kiplinger, the market is settling into a steady upward groove after years of turbulence, and the future is bright for resourceful real estate professionals. 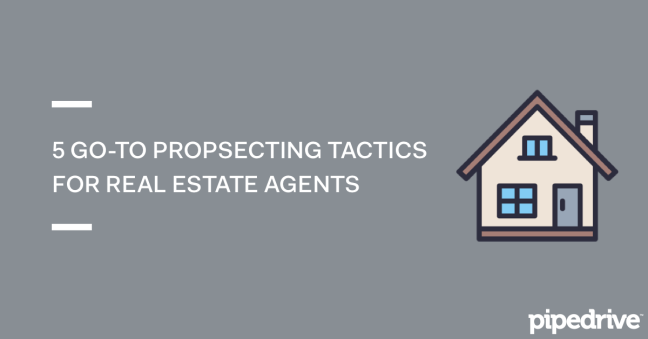 When it comes to prospecting activities for new real estate agents, there is standard operating procedure and there are outside-the-box efforts. Successful agents pursue both, which means completing the daily tasks that have worked for decades — calling expired listings, reaching out to “For Sale By Owner” properties — and doing the things that make you stand out in our digital world, such as personal branding and content marketing. By taking a disciplined, activities-based approach to your new real estate career and tracking your efforts, you’ll have a book of business and referrals much faster than if you take a scattershot approach. Stay focused, get busy pursuing the following strategies suggested by successful real estate professionals from across the United States, track your efforts, and 2016 will be a strong year. Because friends and family are the easiest people to do business with, you must let everyone know you are a real estate agent. This is a good place to start, but it’s not a one-time event. “I am currently a top producing agent in my marketplace due to my proactive, activity-based approach towards generating listings and sales,” said Dan Mumm, a Zillow-verified top-producing agent with Berkshire Hathaway Home Services in Las Vegas. Mumm closed more than 20 deals in his first year. He suggests calling, texting and sending messages on social media. Track your efforts with a CRM and don't stop after a single effort. Make this outreach part of a larger strategy that involves setting activity-based goals for your business. If you’re pursuing a career as a real estate agent, it helps to select a niche in the market, whether it’s first-time home buyers or multi-unit properties, and become an expert. Then, think about making some clever how-to videos or putting together regular blog posts to share your knowledge and build your brand. The type of content that works best for Fitzgerald is anything that strikes an emotional chord with his audience. For instance, his article 10 Reasons to Sell with a Realtor performed very well on social media because real estate agents shared it. He’s also had good luck writing advice and answering new agents’ questions. Savvy content marketing efforts are cumulative, which means every piece of content you produce to build your personal real estate brand builds on all the others. Be consistent with your tone, look and message, and use web analytics to track what kind of content is getting the most results. As in most industries, deep knowledge is power in real estate. Both buyers and sellers respect agents who know things they don’t know and can speak intelligently to trends, new laws or long-term economic outlooks for an area. “Get involved in your local government,” said Shelley Griffin, a Harcourts agent who’s ranked consistently among top producing individual agents in the real estate market in Central Oregon, and ranked No. 10 out of all agents in the Harcourts USA network. “Go to city council meetings or chamber meetings to get a good understanding of how your town works. Focus on a single area and get to understand it from all angles. Understand the schools and any issues like zoning or new building in that area. In other words, if clicking around on your local county assessor’s website is your idea of a good time, you’ll do well. Maintain a methodical approach as you study, and take local decision makers out for lunch or coffee to get the real story on what’s going on in your area. It’s your job. Don’t think about all the closings you’ll soon be attending. Think about appointments, appointments, appointments. This is the sales pipeline input over which you have control — and the activity that is most likely to lead to the closings of your dreams. “New agents need to understand their key performance indicators — this means knowing how their efforts and milestones end up producing commission,” said Patrick Sprouse, president of Autus Real Estate and Development in Washington, D.C., and Houston. Sprouse explained that key performance indicators are the foundational structure of a real estate business plan, and include leads, first appointments, service agreements, contracts executed and sales or leases signed. It’s helpful to know that you're selling a service and to work for specific results — first appointments — as opposed to deals in general. Methodical processes and analytical tracking is required to create results. Successful real estate agents have a passion for the community in which they live. It helps enormously to know the area well and take a problem-solving attitude to everything involving the real estate business, from securing a home loan to fixing a crumbling driveway. Because people prefer to buy from people they like and already know, one of your key sales activities as a new agent is getting to know a lot of people. Last year, Alfriend hired two agents with no experience. One is a mother of teens, and worried about the use of drugs in the school system. She connected with the local DARE officers to start hosting parent information meetings. She coordinates the meetings and introduces the speakers. According to Alfriend, as a result of contacts made through this activity, she sold nine homes in her first seven months. The second hire is a recent college grad who played soccer. He’s now a volunteer soccer coach for young children, connecting to growing families. According to Alfriend, through this activity he sold four homes in his first six months. Connecting with your community in a meaningful way to naturally grow your network of contacts and referrals is a key sales activity — as well as a good way to live. If you liked this post, check out Sales Pipeline Academy to receive actionable emails and kick-start your year as a top-producing real estate agent.